Trying to find time to make a nice dinner for your family this time of year can be a struggle considering all the holiday events, guests, baking of holiday cookies, shopping for gifts, and of course all the ongoing day to day stuff. It is as important as ever to try and find time to sit down and share a meal. This recipe for Roast Pork Loin and Quince Maple Compote is a dish that takes little prep time and then while cooking offers you 30 minutes to open the mail, clean the dishes, and do a few other around the house things that have been nagging at you. Instead of doing all that productive stuff (after all you are already making dinner, and who knows what else you accomplished throughout the day), maybe you could just use the time the roast is in the oven to read a magazine. Leftovers from this meal can be reheated as lunch or dinner the next day. What is important is keeping what you can simple this time of year since there really is so much going on and aren’t you hungry after coming in from the cold? Meals like this one are not terribly involved, but are hearty and delicious. We will try to supply you with a few more ideas like this one during the next few days, and by all means encourage you to share recipes you have using maple syrup that find a way onto the dining room table more often than not. Preheat oven to 400°F. Rub pork with garlic and spices. Place pork, fat side down, in prepared roasting pan. Being careful not to rinse off spices, add wine and stock to pan. Roast pork 30 minutes. Turn roast fat side up. Add quince, maple and water. Cover with foil. Roast until thermometer inserted into center of pork registers 155°F and liquids are almost all absorbed, about 25 minutes longer. Remove roast and set on plate; let stand 10 minutes. Place roasting pan directly on stove top burner on medium heat. Heat pan juices and quince, scraping up Coombs bits as you go. Reduce 2 to 3 minutes. 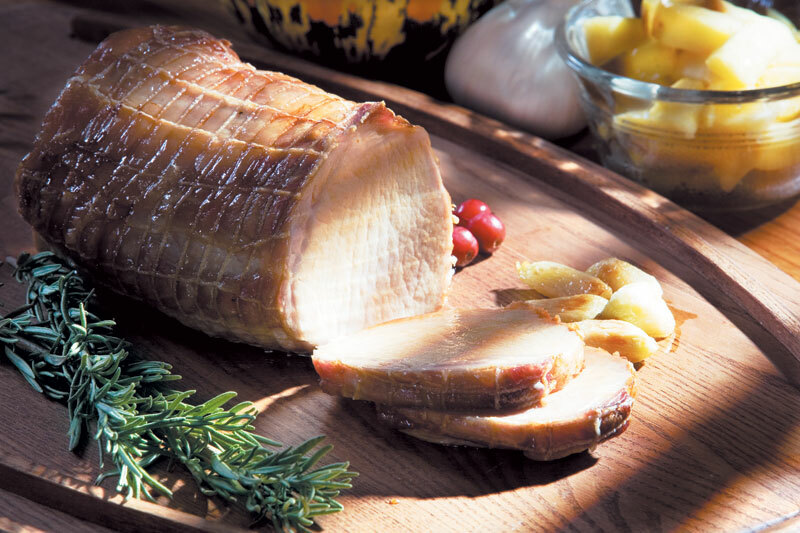 Serve roast thickly sliced with juices and compote on top.